Published once a month. You are on our list because you signed up for one of our programs. To manage your subscription, see link at end of this email. No matter where you live, have an awesome Thanskgiving! We have so much to be grateful for. Sure, a lot of things like finances, aches and pains, relationships, or jobs could be better. But remember.what you focus on expands. Choose to focus on the awesome things in your life—family, friends, animals, a good brain, health, the fact that you're breathing. .And that's what you'll get more of! Attitude is a choice. YOU choose what you want to focus on. Moshi is focusing on enjoying the warm Florida sun and carrot cake for Thanksgiving. This month I'll explain how to use the "Connecting Aids" with a lazy horse to put him on the bit. Next month, I'll talk about connecting the hot Horse. (1)	Close both calves to generate power from behind. (2)	Close your outside hand in a fist to capture, contain, and recycle that power back to the hind legs. (3)	Squeeze and release (vibrate) the inside rein, like squeezing water out of a sponge, to keep your horse's neck straight. Apply the three sets of aids for approximately three seconds. To an observer, it will appear that you're giving the aids simultaneously, but in reality the legs slightly precede the closing of the outside hand, which is applied just before the vibrations with the inside hand. In order to get the desired effect from these connecting aids, it's important that your horse responds obediently to your aids. This is often overlooked, as many of us have a very lazy that seems to ignore our aids. Here are some tips to help you. Your connecting aids won't work if your horse isn't in front of your driving aids. 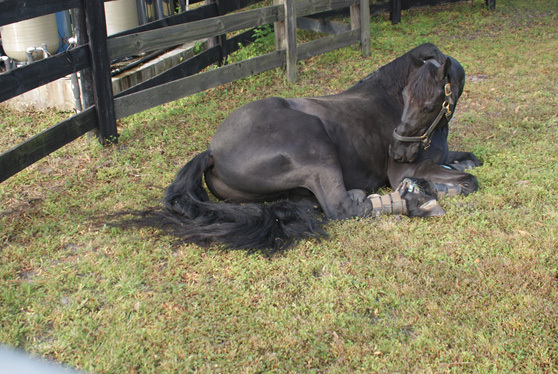 For example, when you put your legs on, your horse should immediately move forward. Remember that horses are extremely sensitive to touch. No matter how lazy a horse is, he can feel a fly land on his side and flick it off. It's usually the rider who makes the horse dull. The horse isn't electric enough, so the rider uses more leg. That works for a while, but then the horse gets dull to that, so the rider starts putting on spurs. Then the horse gets used to that so the spurs get bigger. This cycle is common, and as time goes by, the leg aid gets louder and louder. The reason your horse isn't reacting to light aids is probably because you've started "screaming" with your aids, and he's tuned you out. The first thing you have to do is decide that you're not going to close your legs any stronger than a fly landing on your horse's side. When you whisper with an aid, your horse should shout his answer-instead of the other way around. Instead of constantly repeating your aid or making it stronger, make a correction. The correction for the lazy horse depends on his sensitivity. You can either bump-bump-bump with your legs, or you can use your whip and tap-tap-tap to chase your horse forward. Either way, you need to get a really forward response. If you're walking, bump or tap until your horse is trotting; if you're trotting, do it until he breaks into the canter. The most important part of the correction is to re-test with a light, whispering aid. For example, in a transition from walk to trot, lightly close your legs, and your horse should surge into the trot. If he doesn't, tap-tap-tap, but then you must go back to the walk and re-test with a very light aid for that transition. When he reacts enthusiastically, praise him. Once he's in front of your leg, go back to using the connecting aids as described above. So many of you have been emailing to ask me when the Happy Horse courses will be available again. I have great news! We're just about finished duplicating and shrink wrapping everything. We should be set to go by Thanksgiving! I'll send you an email when I get the green light from the duplicators. Accept the fact that life is full of ups and downs. Sometimes you win, sometimes you don't. where you are in life, it's up to you to make the most of it. Are you sick and tired of complicated and confusing training techniques? Are you frustrated by negative emotions like fear and lack of confidence? © 2011 Jane Savoie. All rights Reserved.